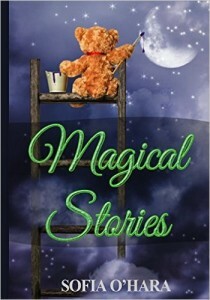 “Magical stories” is a collection of 3 short stories that deal with being different. a crippled frog. The other frogs make fun of him because he can’t jump. friend, Lulu the giant spider. Then, a life-threatening event happens. Oscar and Lulu have to brace themselves and save each other. This is a nice tale for kids ages 8-10 about friendship and overcoming insecurity. The story reminded me the fable about the scorpion and the frog, but Oscar’s story has a completely different ending and quite the opposite message. I wish there were some illustrations to brighten up the story. The second story, Someone like me, tells the story of Lou, a lonely child in desperate need of a friend. Lou wishes upon a star to have a friend like him. His wish is granted in an imaginary way, but nonetheless, Lou finds happiness. Kids ages 8-10 might identify with Lou and find comfort is his story. I feel that the story ends abruptly without a proper ending. The third story, Popular, is aimed for older kids, maybe 12 and up. Jenna is being bullied at school by the boy she likes. She is devastated, but on her way back home she sees an advert that changes her world. I feel that there is great potential in this story. It has a strong core and an original solution to a well-known teen issue. However, I think that the story would benefit with additional developing and editing.